A wedding is a beautiful beginning – whether it is your first or fourth time! What is important to remember is that if you are inviting people to observe and join in the celebration, you must plan your wedding just as you would be planning a dinner party in your home – that is, you must take into consideration the feelings of those you are inviting. No matter how large or small, planning a wedding takes time and discipline and can be a major undertaking. In planning a wedding you will have to deal with relationships and be able with tact to solve many challenges! Your sister is your biggest supporter, but then refuses to wear the bridesmaid dress you selected for the color made her look pale! Your future mother-in-law continually calls to add someone to the invitation lists, even after all the invitations were mailed and the addition of guests from “her” side of the family means “your” side has been shorted! All in all the days leading up to your wedding can bring out the very worst in people! What can you do? How can you handle all these challenges with love and consideration? Secrets for that Perfect Wedding! 1. Always maintain respect for everyone who gives input to your wedding – even when you disagree with them. It is important to allow everyone to give their input. You can make note of their suggestions, but in the end the decision is made between you and your fiancée. Always preface your remarks with a positive, “I appreciate your suggestion and I will take it into consideration. We will make a decision within the next few weeks.” Never get into an argument. 2. Develop a budget in the beginning for this will provide you with a list of approximate costs for everything. 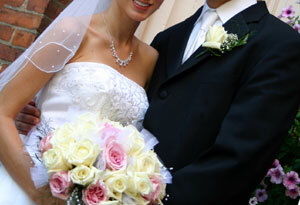 Be sure to factor an additional 10% for most weddings exceed the original planned amount. 3. Never assume anything – always double check everything! If you delegate any responsibilities to a friend always call to reconfirm that they are following through with their assignment. 4. Daily, Monthly Plan Organizer – you can make or purchase one at any bookstore. There are so many on the market and are very useful to keep you on tract with the timelines, budget considerations and basic etiquettes for a wedding. 5. Even with the traditional wedding guidelines, this is your wedding and once you understand all that is involved you can begin to delegate the financial responsibility accordingly. The important thing is to identify what your plans are and who will pay. This should be done in the very beginning. 6. Scheduling – most weddings take six months or longer to plan. Three months is the minimum when planning an informal wedding. What most brides forget is the wedding dress – so allow eight to twelve weeks since it may be custom made and will need multiple tailoring sessions to insure it fits properly. 7. Location: once the date and budget are determined, the obvious of course is to settle with the clergyman, location of wedding as well as where the reception will be held. Be prepared to put down a deposit to hold the date – especially if you are selecting a weekend. The earlier the better to secure the site. 9. Vows, invitations – what is proper? Times have changed and you can be as creative as you would like. Tradition is always in vogue and through your church and stationary stores you will find many templates to choose from. Bride and “Congratulations,” to the Groom!